Wire rings are a cost-effective replacement for more traditional circlips; here at Airedale Springs we can provide wire rings and circlips most appropriate for your needs. Used to allow rotation but prevent lateral movement, wire rings and circlips are available for either external use where they are intended to fit over a shaft into a machined groove, or for internal use where they fit inside a bore. Our high-speed CNC equipment and specialized tooling allows us to manufacture a vast range, from standard rings to those requiring special ends or non-standard shaped gaps. 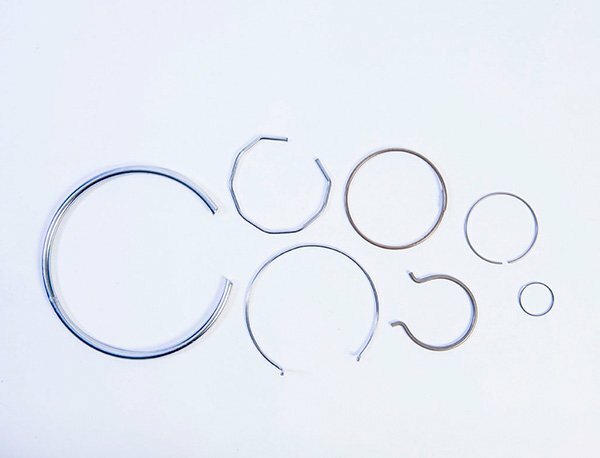 We can work with a variety of different wire diameters and external diameters, and take into account a wide range of factors to ensure that your wire rings or circlips meet your requirements perfectly. We pride ourselves not only on the superb quality of our products, but also on the quality of our service; our expert team will help you to ascertain the right product for your needs, and we’ll make sure that it arrives on time and ready to use. If you have used circlips or wire rings before, you’ll know that those produced with a gap larger than the diameter of the wire can be prone to tangling. In order to ensure that your products arrive in perfect condition, we have developed innovative packing methods which not only provide protection during storage and transport but also avoid tangling and aid auto assembly. Whether it’s a small batch, an ongoing requirement or a bulk order, Airedale Springs offer high-quality products and an efficient, personal service every time. For more information on rings and circlips, or on any other form of spring we manufacture, contact us today. It’s helpful to know the application of the ring or circlip. Does it need to contract (in a groove), or expand (over a shaft) when fitted? This may affect the manufacturing method and materials we use.